Request a Speaker. Be a Speaker! We need to understand more than the technology of renewable energy to leverage its potential to create a more sustainable society. 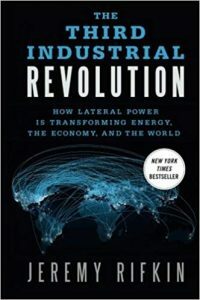 From his vantage as President of the Foundation of Economic Trends, author of 18 best-selling books, and influential international advisor, particularly to European governments and international corporations, Jeremy Rifkin offers a compelling vision and social roadmap of how renewable energy and the internet will transform the economy and society in the third industrial revolution. Our next book invites us to consider renewable energy and society in our on-going journey to make a more sustainable future. Join us for a transformative discussion of The Third Industrial Revolution by Jeremy Rifkin.